The mechanical parts are bulletproof, but the 1980s electronics are beyond repair. 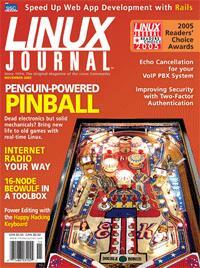 Embedded Linux to the rescue. Hours of commercial-free programs, your favorite music and you might even catch Doc Searls. Bring Internet radio to your regular listening spot. It fits under an airplane seat and uses a laptop power supply. No, not a laptop—a 16-node Beowulf cluster in a box. Your favorite distribution is what? This year, maybe the rest of the readers finally agree with you. An old problem for long-distance lines is back for the Internet. Fortunately, today we have better tools to deal with it. Increase the range and functionality of your power-line network with an embedded Linux device that helps connect distant nodes.